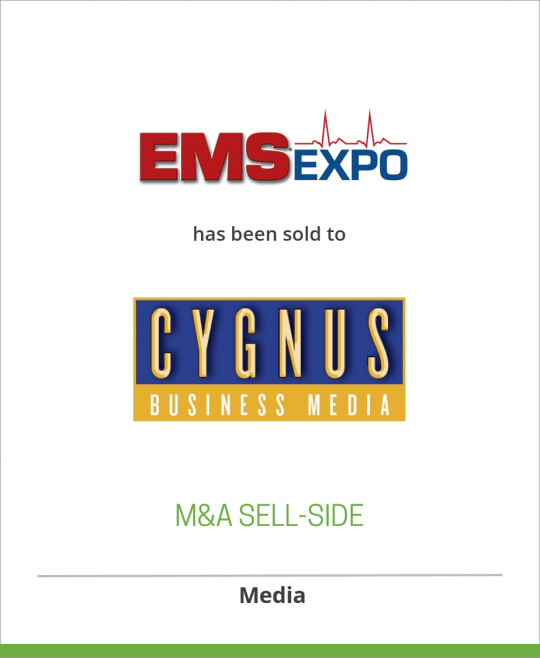 Summer Communications and Expo Productions, including EMS Magazine and the EMS Expo, have been acquired by Cygnus Business Media. The Seller Summer Communications and Expo Productions, based in Van Nuys, California, publish the leading magazines for emergency medical services (“EMS”) professionals and operate the largest standalone educational conference and trade show in the world for EMS professionals. The company’s flagship magazine is Emergency Medical Services Magazine (EMS), the Journal of Emergency Care, Rescue and Transportation, which has led the field for 33 years. EMS is published monthly and has a circulation of 53,598. In addition, the company publishes two other magazines: Advanced Rescue Technology and Frontline First Responder. EMS Expo is the nation’s number one emergency medical services trade show and conference, spanning over 90,000 net square feet of exhibit space. The Buyer Cygnus Business Media, a leading diversified business-to-business media company, Cygnus currently owns the fire service market’s top trade shows, magazine and website. With this acquisition, Cygnus Business Media’s Fire Rescue & EMS print market segment will reach over 200,000 subscribers who are firefighters, emergency service professionals, independent EMS/Rescue Response departments, private EMS/Rescue Response Units, and disaster preparedness agencies. Cygnus Business Media reaches nearly 15 million business owners, executives and professionals annually through its portfolio of over 200 media products. Its four distinct divisions – Cygnus Publishing, Cygnus Expositions, Cygnus Interactive and Cygnus Custom Marketing – provide comprehensive, integrated advertising and marketing programs for Cygnus’ customers and clients. For more information, visit www.cygnusb2b.com.